I mean, don’t get me wrong. I had a plan. But I didn’t want to screw up. 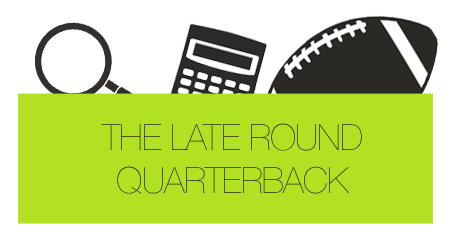 I put a lot of time and effort into my ridiculous fantasy football discourse and I wanted you, you and you to know and learn about the late-round quarterback philosophy. I wanted you to learn about it a lot. Seven months and nearly one hundred blog entries later – it’s over. Year one is complete. The 2012 NFL regular season is finished. A guy named T.Y. was the best fantasy rookie receiver, and Adrian Peterson showed that he doesn’t bleed like you and I do (because he’s a robot). Peyton Manning didn’t lose a step, Michael Turner did, and Ryan Mathews broke more clavicles than he scored touchdowns. The year was nothing short of entertaining. And, of course, the late-round quarterback strategy proved valid once again. But that’s not what this is about. I’ll save that jargon for another post. My intentions with this post aren’t to belittle your August Aaron Rodgers draft choice. I won’t throw up numbers to show you why that was a bad idea. Instead, I want to look at other aspects of our beloved fake sport. We all realize that the NFL is an ever-changing league. What we take from one season isn’t always attributable to the next. Just because 2011 showcased almost five 5,000-yard passers doesn’t mean that benchmark should be the new norm. After all, there were 2011-specific circumstances (e.g. the near-lockout) that led to an insane pass-favorable season. This doesn’t mean, however, that there aren’t 2012 tidbits to capture that can help guide our 2013 fantasy choices. Sure, we shouldn’t expect another 2,000-yard rushing season from Adrian Peterson, or for another initialed rookie to lead all receivers in fantasy points. But there are takeaways. And these are some of mine. 1. Never question historical greats. Peyton Manning was a player that I was actually high on coming into the season. As more and more people saw his pre-season play, his ADP rose, and my chance of getting him fell. But there were still question marks surrounding the Broncos’ signal caller entering the regular season. “Is his neck going to survive the punishment of NFL linebackers and defensive lineman?” we’d ask. Well, 16 games later, I think it’s safe to say that we shouldn’t question Peyton Manning’s ability, as long as he’s under center, ever again. Adrian Peterson falls into the exact same boat. I avoided him in my drafts because I couldn’t comprehend how a near-knee destruction could turn into production just 8 months later. I thought that, sure, he could be a top-3 back, but I didn’t want to make that risky choice early in my drafts. Clearly incorrect, I now sit here and will never ponder whether or not Adrian Peterson is a worthwhile draft choice. Instead, I’ll wonder whether he’s human or robot. Peyton Manning and Adrian Peterson. They’re two of the greatest players of this era, and when we go to draft in 2013, as long as they’re on the field, we shouldn’t question whether or not they should be there. They always should be as long as they’re moderately healthy. 2. Rob Gronkowski is by far fantasy football’s best tight end. The Patriots extroverted tight end missed five games this season and still finished as the second highest scoring player at his position. Now, I don’t want to get too far into cumulative totals because it’s not the best way to judge fantasy success of a player, but that stat alone is alarming. We all thought – including myself – that it was going to be Aaron Hernandez’s year. His injury didn’t help his cause, but it’s very, very clear that Gronk is Tom Brady’s favorite target. His 11 touchdowns led all tight ends for a second straight season, and his 790 yards ranked 7th. Remember, he played in only 11 games. Next season, Gronkowski has a great shot at being a first-round draft choice. While I’ll never get a tight end that early, I can understand why someone would want him. From a value standpoint, he’s by far the best at the position, and his reliance on touchdowns is fine because he scores touchdowns all of the time. If healthy, Gronkowski will get you the points you need. I can now guarantee that. 3. Rookie quarterbacks can hold value. The late-round quarterback strategy allows you to take risks at the quarterback position when drafting. In 2012, if you took a shot with RGIII, you clearly reaped the benefits. But don’t forget about Andrew Luck and Russell Wilson, too. Luck ended the season as a top-10 quarterback, and Russell Wilson, after Week 8, had just one performance under 15 fantasy points. The rookie class this season was the best we’d ever seen in fantasy. And while we shouldn’t expect this every season, we have to keep an eye out on those special players. Getting a rookie quarterback in an offense that will surely throw the ball, like Luck, isn’t a bad idea. And taking a chance on a running signal caller could be a smart one too. 4. Quantity is better than Quality. One of my blog entries this season that helped catapult some of my thinking was about the direct correlation between running back carries and fantasy success. Sure, it’s obvious, but it helped define the reason running backs were so vital to your fantasy achievements. Looking at 2012, the same idea (and again, it’s a clear one) held true. Adrian Peterson and Arian Foster had the most touches, and they were the top two fantasy backs. Doug Martin finished third among running backs, and he had the fourth most carries. I could go on and on. The one thing that we should point out, however, are the unsexy players on this list. BenJarvus Green-Ellis had the 8th most carries in the NFL, an he finished as the 19th ranked running back. Shonn Greene, who we all know is bad at football, finished the season as the 15th best back. Michael Turner, who simply was fed the ball relentlessly on the goal line, finished as the 17th ranked one. This notion isn’t applicable to just running backs, either. I think it’s smart for everyone to start thinking about quarterback passing attempts when evaluating a player’s fantasy ability. In year’s past, the difference in passing attempts wasn’t nearly as significant as it is now. After all, the reason Andrew Luck was able to become a top-10 quarterback, as mentioned above, was because he threw the ball 627 times, more than all but four quarterbacks. In 2003, no quarterback threw more than 570 times. 5. Except if you’re CJ Spiller. Spiller is an unbelievably unique case to the quantity discussion above. When you average 6 yards per carry, that’s bound to happen. He is one of the guys that I’d love to pair with a quantity running back next season. Imagine if he’d actually get the carries he deserves? I fully expect Spiller to be a late-first rounder to early-second rounder in 2013. The questions around his use will probably be answered by the time you draft in August, but for now, let’s assume Fred Jackson still is stealing looks. 6. Drafting holdouts is still a bad idea. The culprits this season? Maurice Jones-Drew and Mike Wallace. Jones-Drew was slowly putting together a respectable season before going down to injury. But, as we all know, not having training camp and a pre-season just increases the chances of that happening. Mike Wallace is a different kind of story. His lack of production was truly based on laziness. Being a Steeler fan, I’ve never been more disappointed in one single Steeler’s performance. Did I expect a lot from Wallace this year? No, not really. But I did expect him to fight for passes, not stop on deep balls and play some defense when the ball was intercepted. There are bound to be more holdouts in the future years of the NFL. And if it’s up to me, I’m going to continue to stay away. 7. Streaming bad defenses is really, really fun. I’ve always streamed defenses. From a mathematical and logic standpoint, there’s no reason to play the same defense week in and week out. And there’s little rationale in selecting one early during your fantasy draft. But when I’ve streamed defenses in the past, I’ve done so thinking I still had to play a respectable one. Now, I play defenses according to how atrocious the opposing offense is. Let’s use an example. If you were to only play the defense facing the Chiefs each and every week, the cumulative total in standard leagues from your defense in 2012 would have equaled 183 points. That “defense” would rank third amongst all defenses. One interesting thing, too, is that the majority of the defenses that faced Kansas City weren’t ownable defenses. Pittsburgh, Denver and San Diego were the only ones that people probably had rostered consistently throughout the season. Stream your defenses. It’s the only way to do it. 8. We have to start treating Megatron like a running back. I got it wrong. I didn’t think Megatron was a worthwhile top selection because of his 2011 reliance on touchdowns. It looked good over the first 8 weeks of the season, but man, he really turned it on, eh? The fact is, Stafford’s distribution makes Calvin Johnson more of a running back. What do I mean? Touches. Megatron had 6 games with double-digit receptions, and he had 11 games with more than 100 yards. Even when he didn’t get into the end zone, his yardage totals were outscoring the majority of running backs. Now, as I love to tell people, when something historical happens, we shouldn’t pretend that it’s the new norm. But remember point number one above? Calvin Johnson is a “great”. And because of that, he should be a top-5 pick in 2013. 9. There’s no such thing as ‘never bench your studs’. The offensive shift in the NFL has paved a new path in fantasy football. Slot receivers (I’m talking to you, Randall Cobb) are just as important as number one guys, and third down running backs (Hey there, Joique Bell) can be effective too. Because of this, the idea of “never benching your studs” should no longer be valued. We all have to remember not to get too attached to particular players as well. If you started Larry Fitzgerald each week because you drafted him in the second round, then I’m sure your fantasy season didn’t go as planned. Of course there are players (Calvin Johnson, Adrian Peterson, etc.) that you should never bench, but playing by matchup is really the smartest way to go with fantasy football. 10. Twitter is the best medium for fantasy football information. I’ve had a blast learning from some of the best out there throughout my inaugural fantasy football-writing season. There’s no need for particular shout outs, as that’s rather 5th grade-like, but I do want to thank everyone who has supported me, this site and my book over the last 6 or 7 months. The 2013 season will surely be another one full of new football trends and ideas – both on the field and in fantasy football. In an NFL that changes by the day, new thoughts are bound to come to the forefront. Except for the notion of drafting your quarterback early. That will never be a good idea.